Phonographic Copyright (p) – Sanctuary Copyrights Ltd. Copyright (c) – Sanctuary Copyrights Ltd. Recorded at Gate Studio, Wolfsburg, Germany & Pathway Sound Studios, Wolfsburg December 2000 - March 2001. Mixed & Mastered by Sascha Paeth at Pathway Sound Studios - February 2001. "Forever" is based on "Solveig's Song", written by Edward Grieg for his Peer Gynt Suites. "Don't You Cry" is dedicated to Thomas Youngblood Sr., who died when his son was very young. The trilogy of songs that close the album on the normal edition, "Elizabeth" I, II & III, are based on the story of Elizabeth Bathory. There is silence from the end of "Fall From Grace" to 11:01. 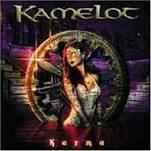 This is because Karma was Kamelot's fifth studio album and they wanted its duration to be 55:55.